This is all my fault. Really. I have never successfully worn ear plugs, and staying in a century-old hotel above a pub ... well ... I should have known that it would be noisy. And I was ready for noisy until 2:30 or so... just not noisy until 5. But there you go. So I was less than fresh when we left the hotel a little before 8 in search of coffee and a dry place to wait for the ship, but I perked up pretty quickly. And then, ship ahoy! It was surprisingly interesting to be on the shore and watch a cruise ship dock. There's some maneuvering, lots of ropes thrown, and gangways shifted. We were surprised that there wasn't a huge RUSH of people off the ship, more like a trickle. But we shifted over so that we could see the gangway and watched as Jenny herded her ducklings into a group on the dock before Mila led them up the ramp and over in our direction. Anyone else ever drive a bus like this? Me neither. Just kidding. I drove it here. I just turned 16 yesterday and got my license. I started singing "Happy Birthday", and the rest of the bus quickly joined in. He said, "No, wait -- I was joking" and then just let us go with it. 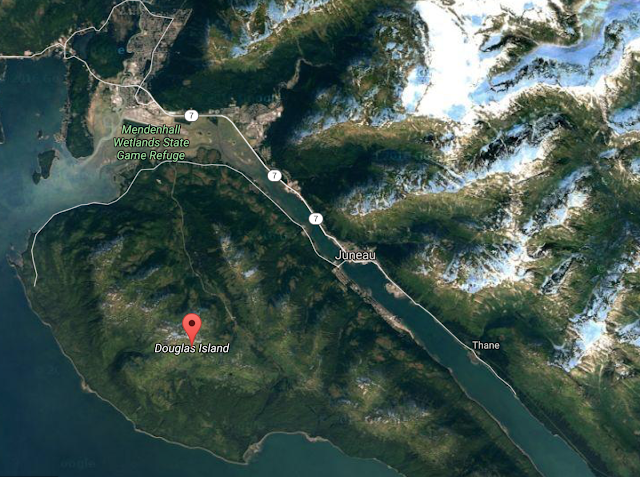 Among other facts, we learned that there are 3500 people who live in Juneau, and 2500 eagles; that the Juneau McDonald's had the third busiest single-day operation, behind only Moscow and Beijing; and that the body of land visible from the Alaska Governor's Mansion, despite what we might have heard, was NOT Russia but was Douglas Island, our destination. We arrived at the end of the road ... really, THE END OF THE ROAD. Along the way we were met by enthusiastic members of the Juneau-Douglas High School XC team, who would staff our water stations and cheer for us during our run. We gathered, adjusting layers and putting our bags into "gear cars" to keep it dry. John gave a little talk, explained that there was a 5K turnaround, then a half marathon turnaround, and the half marathoners would run the course twice. And then we were off and running. Because a lot of the people were running the 5K, we didn't actually see them after the start, except when the first bus headed back to Juneau as we came back in at the halfway point. The course was along a quiet road, and opened up on some amazing views. We got super lucky in that it never more than drizzled on us while we were out running. Must be because I kept my Gore-Tex jacket tied around my waist, just in case. 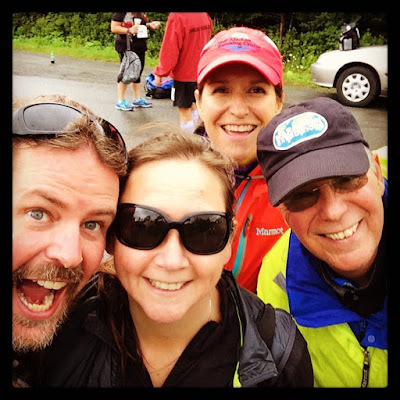 We finished just as a bus was loading to go back to Juneau, but decided that we would stay and cheer the runners in. It was nice to stand around and chat with people, whoop when someone came in, and just relax outside. We also had a few minutes to chat with John and Jenny, which is always lovely. Oh, and we visited the "sauna truck" and quickly changed into fresh clothes. 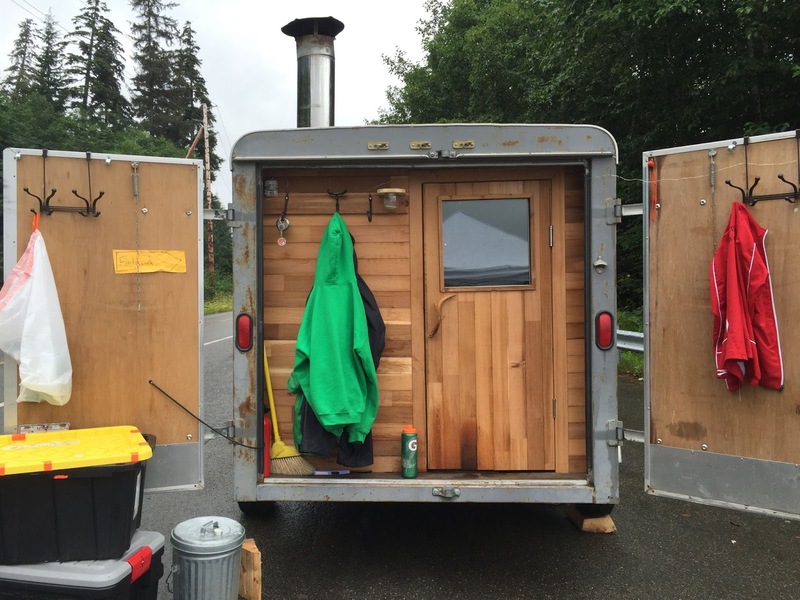 A mobile sauna in a truck! What's not to LOVE? Eventually, our final finishers came in and we all piled on to the last bus. As we drove back to town the skies opened up and it started POURING. Then the real fun started! The four of us went to the Hangar, where we scored a perfect booth by the window and had a delicious lunch. We also walked over to the Bubble Room in the Baranof Hotel, which is much more "old money" than "bubbly", but a fine place to sit and have a quiet drink. After a shower and a quick nap, we headed out again to see "Juneau by night". It is astounding how quiet the streets are when the ships sail. And then there was MORE fish (and chips! ), more pints different Alaskan Brewing beer, and then -- after a quick lesson on HOW TO WEAR EARPLUGS -- there was a surprisingly good night's sleep. 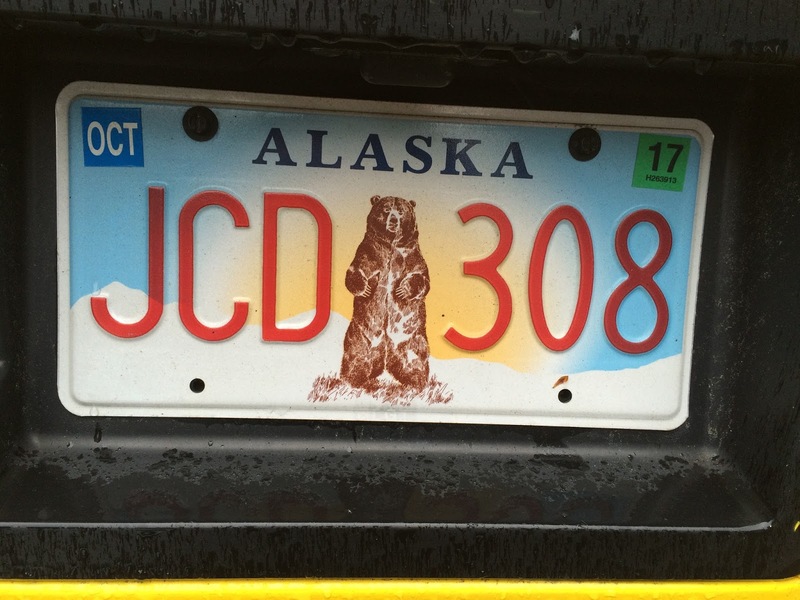 Juneau what? 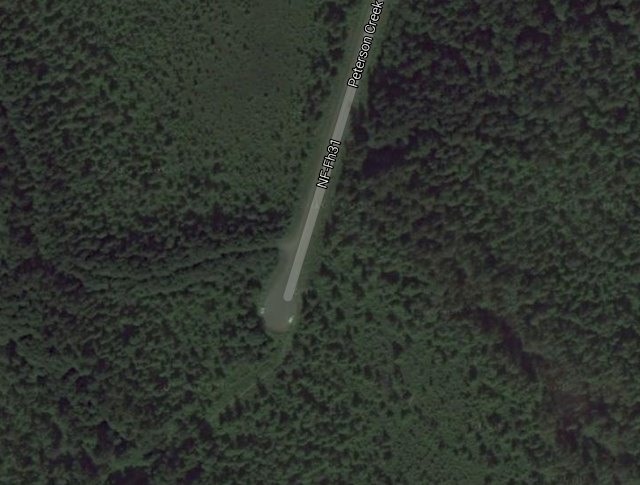 I dunno, Alaska.